(SitNews) - NOAA Fisheries has determined a male Cook Inlet beluga whale calf found stranded in Cook Inlet in September 2017, and rehabilitated at the Alaska SeaLife Center, is not capable of surviving on his own, and cannot be released back into the wild. This male Cook Inlet beluga calf has been cared for at the Alaska SeaLife Center since it was rescued from a mudflat in western Cook Inlet on Sept. 30, 2017. Photo taken by ASLC under MMHSRP permit #18786-02. Experts from NOAA Fisheries’ Marine Mammal Health and Stranding Response Program say the calf, named “Tyonek” by staff at the ASLC, was a newborn when he stranded and less than one month old. He is nutritionally and socially dependent, lacks both survival and socialization skills needed to be successful on his own in the wild, and it is likely his mother either abandoned him or died. 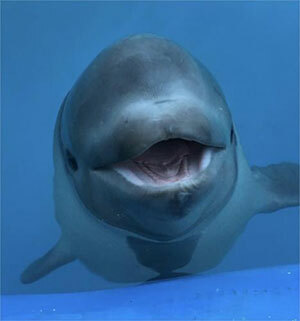 The calf also experienced a collapsed lung - a condition which may recur and compromise survivability in the wild by limiting his ability to dive. This non-releasable decision comes after 24/7 care by experts at the ASLC for more than three months. The calf will be placed into permanent care at a U.S. facility through a process outlined by NOAA Fisheries Office of Protected Resources. The placement decision is expected in the coming weeks. Once that decision is made, NOAA will work with the recipient facility to expedite the calf’s transportation and transition so that he can be integrated into a social group where he can thrive with other whales. The calf belongs to a population of belugas designated as endangered under the Endangered Species Act and depleted under the Marine Mammal Protection Act. We want to thank all those involved in the rescue and recovery of Tyonek—from the NOAA law enforcement officer who first spotted the calf stranded on the mudflats, the Alaska Wildlife Troopers’ aviation section pilot who configured the helicopter space to transport the calf safely to Anchorage, and State of Alaska Department of Public Safety that provided a hangar for care of the calf until the Alaska SeaLife Center transport team arrived, to all the staff at the ASLC and partner aquariums who provided great care to ensure the calf’s survival. The Cook Inlet beluga whale is one of eight endangered species that NOAA Fisheries has identified as part of the nationwide Species in the Spotlight initiative to stabilize population declines and focus resources on the species that are most at risk of extinction. NOAA scientists estimate their abundance at about 328 animals.